Important: This feature requires the Advanced Storage Module. See Adding Modules for more information on purchasing modules. The Modified Kinetic Battery Model accounts for rate dependent losses, temperature dependence on capacity, and temperature effects on calendar life. The model estimates cycle lifetime using the Rainflow Counting method. The storage components that require the Advanced Storage Module are denoted with the text [ASM] appended to their name. 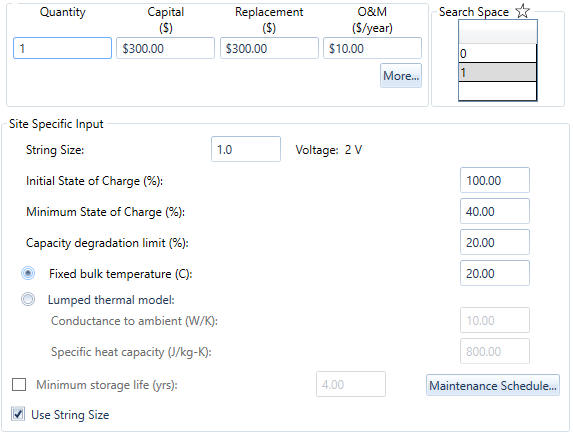 The properties section lists the parameters of the Modified Kinetic Battery Model for the selected battery. You can change these properties in the Storage Library. 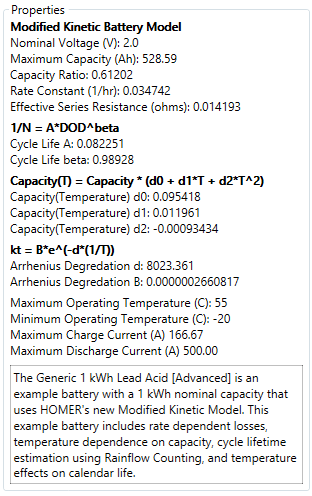 See the Creating a Modified Kinetic Storage Component and Modified Kinetic Battery Model sections of the help for a detailed explanation of these properties. The Site Specific Input section allows you to enter several parameters that could vary from project to project. You can also set multiple values for any of these parameters to perform a sensitivity analysis. The state of charge at the start of the simulation, in percent. The minimum allowed state of charge of the battery during simulation. Whether HOMER simulates the battery with a fixed internal temperature or uses a lumped thermal model to simulate the battery bank's internal temperature. The percent degradation in capacity that triggers replacement of the component. The component is replaced when either of the two degradation variables exceed this limit. See Modified Kinetic Battery Model for details.